HNBR is created by partially or fully hydrogenating NBR. The hydrogenating process saturates the polymeric chain with accompanying improvements to the ozone, heat and aging resistance of the elastomer and improves overall mechanical properties. HNBR, like Nitrile, increasing the acrylonitrile content increase resistance to heat and petroleum based oils and fuels, but decreases the low temperature performance. 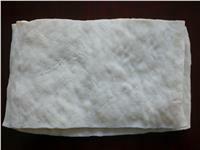 Usage:HNBR has excellent heat and oil resistance, improved fuel, ozone resistance and good abrasion resistance.